FREE SHIPPING TO MANY STATES...Ask our staff for additional details!! There are no additional FEES/ADD ONS to be added to our price! This saves you up to $2500 over what other dealers charge in extra fees including Documentary, Notary, Prep, ADM, and Environmental. We are one of the only stores in the USA with no fees, that is why we sell all over the country - saving our customer's thousands! Many customers don't realize how much in extra fees they pay when buying a car. We also offer free delivery/airfare to many states. 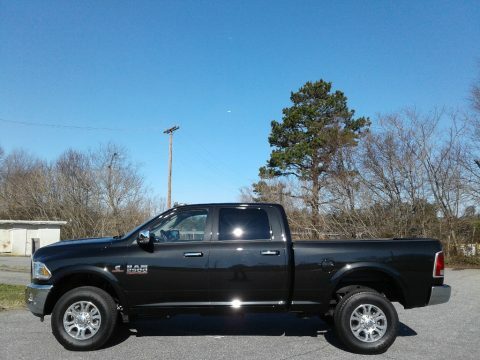 This is a new 2018 RAM 2500 Laramie Crew Cab 4X4 with the Cummins Turbo Diesel Engine and 6 Speed Automatic Transmission. It comes with the 3 year - 36,000 mile Factory Bumper to Bumper Warranty as well as a 5 year - 100,000 Factory Powertrain Warranty. It is equipped with 3.42 Axle Ratio, Trailer Brake Control, Power Chrome Trailer Tow Mirrors w/Power Fold-Away, Keyless Entry, Remote Start System, Diesel Exhaust Brake, Trailer Tow with 4-Pin Connector Wiring, 7 Pin Wiring Harness, Class V Receiver Hitch, A/C with Dual Zone Automatic Temperature Control, Uconnect 4C w/ 8.4 Inch Touchscreen Display, AM/FM/SXM Apple CarPlay and; Google Android Auto Capable, Integrated Voice Command with Bluetooth, 9 Alpine Speakers with Subwoofer, Media Hub (USB, Aux), Heated and Ventilated Front Seats, Heated Leather Wrapped Steering Wheel w/ Audio Controls, Folding Flat load Floor Storage, ParkView Rear Back-Up Camera, ParkSense Front / Rear Park Assist System and 1 Year Subscription to SiriusXM. The MSRP is $62,730. Internet and E-Bay pricing include rebates/incentives. You may be eligible for additional discounts, ask for details!